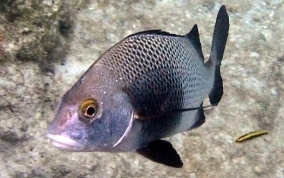 The Black Margate is a member of the Grunt family of fishes. They have a very high back profile and thick, yellow-gold eye rims. 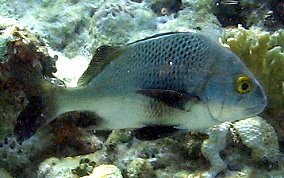 The body is silver with a scale pattern like the Sailors Choice, another member of the Grunt family, but has a large, dusky, almost black smudge on the rib cage behind the pectoral fins. The fins are also the dusky dark color. 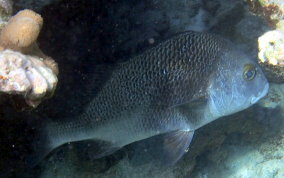 Seldom swimming in the open during the day, find them in large recesses and in cave openings. Not real common. 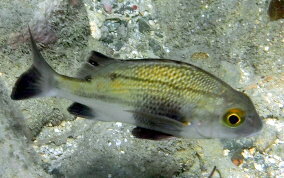 These specimens were seen in about six feet of water. 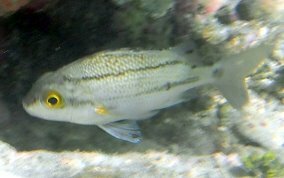 They have a two section dorsal fin. 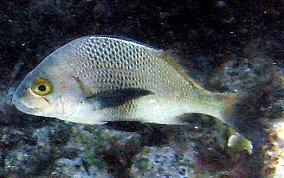 The fore dorsal, which is laid back in all these pictures and the rear dorsal which can be seen in several of the pictures. 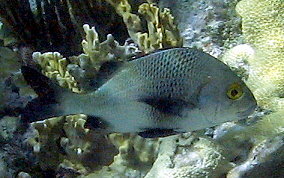 Their pectoral fins are shaped very much like the Permit's. 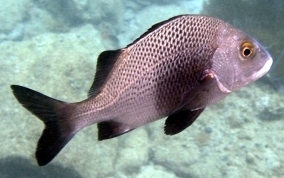 The Black Margate is one of the largest Grunts, growing to a possible 18 inch length. Compared to other Grunts, they have thick lips.